Protein synthesis is programmed by messenger RNAs, and when enough of a given protein has been made, the mRNAs that encode it are destroyed. LMU researchers have now shown that protein synthesis and mRNA degradation are structurally linked. In all cells, the genetic information stored in DNA molecules encodes the instructions for the synthesis of proteins. The information is first “transcribed” into messenger RNAs, which program molecular machines called ribosomes that “translate” the instructions into defined sequences of amino acids, i.e. proteins with specific functions. When an mRNA molecule is no longer needed or is recognized as being defective, it is delivered to a protein complex known as an exosome. This organelle serves as a molecular shredder, and slices mRNAs into their component subunits, starting from the trailing (3’) end of the molecule. Roland Beckmann, in collaboration with researchers at the Max Planck Institute for Biochemistry and the Institut Pasteur (Paris), has now shown that there is a direct molecular link between the ribosome and the exosome that degrades mRNAs. Their findings were published recently in the leading journal Science. 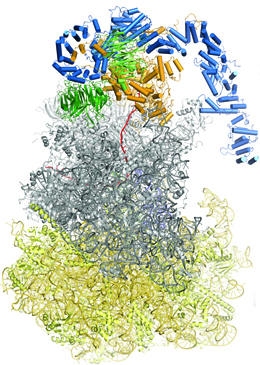 The cryo-EM structure of a ribosome-Ski2-Ski3-Ski8 helicase complex. Schmidt C, Kowalinski E, Shanmuganathan V, Defenouillère Q, Braunger K, Heuer A, Pech M, Namane A, Berninghausen O, Fromont-Racine M, Jacquier A, Conti E, Becker T, Beckmann R.